We’ve known for a while that Noomi Rapace would be reprising her role as Prometheus’ Liz Shaw in Covenant—but now a rather oblique piece of viral marketing seems to have dropped a big hint about her appearance in the film. It doesn’t offer that much new, but the quick flash of a hashtag at the end—#emoh_em_ekat—takes you to a similarly-named Instagram account, which has an extended bit of footage from the TV spot. 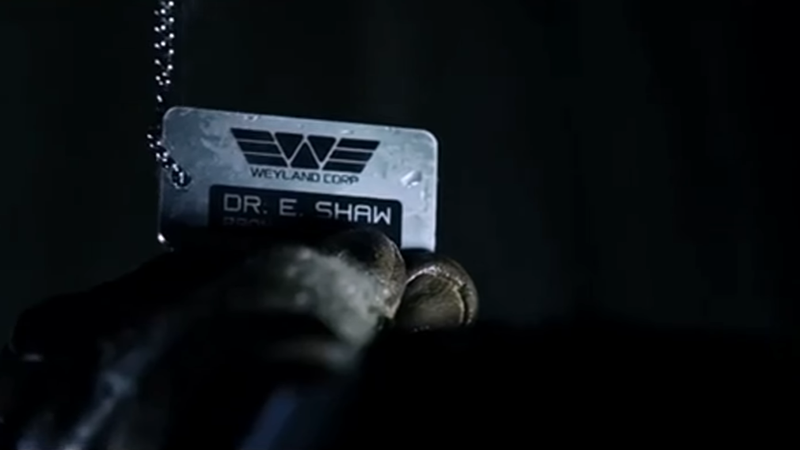 Not only do we get to see Shaw’s name on those ominously dangling tags from the earlier trailers, we also seemingly get to see a hologram of Shaw herself, at the controls of the mysterious Engineer ship the Covenant crew discover, singing along to Denver’s tune. Considering we don’t see a body on the ship, there doesn’t appear to be much hope for seeing Rapace’s character again safe and sound. You can even see a tiny glimpse of what appears to be a Xenomorph tail appear behind her hologram in the footage, so it seems like poor Dr. Shaw got taken out by the new film’s beast. Alien: Covenant hits theaters May 19.